Yesterday was just that. A day of two halves. 1st half was pretty poor, but things came to life in the second period. Kick off is early, 6am again. I'm following a tip for some Yellow Wagtails. I've seen a handful so far this spring but none I could photograph. So I speed off down Chiffchaff Alley towards Lower Heswall with the gear in the rucsack. I stop close to Dawpool Nature Reserve when I hear the call of a Lesser Whitethroat. Sadly by the time I assemble the kit it has gone silent. It remains elusive. This sets the theme for the next few hours. Text alert sounds. This early it has to be news of a birdy variety. It is, but it's bad news. "No sign Yellow Wags" Ouch! Oh well, I'm out and in a good spot so I'll see what I can do here. Not much is the answer. I've had some grand days out recently and got some great pictures so I suppose it is inevitable that I'll miss out occasionally. Pack up and head home. Second half of the day gets underway with another text alert. 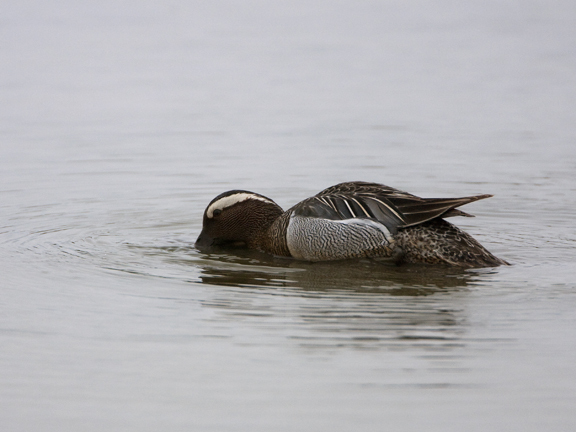 "Pair Garganey at Gilroy". Super Deluxe is back out on the road and I'm pedalling up to the reserve. As I arrive there are a couple of birders present, good sign they must still be here. A Common Sandpiper has dropped in with the ducks and is strutting around the muddy banks of the pool I last visited to look for colour ringed Blackwits. 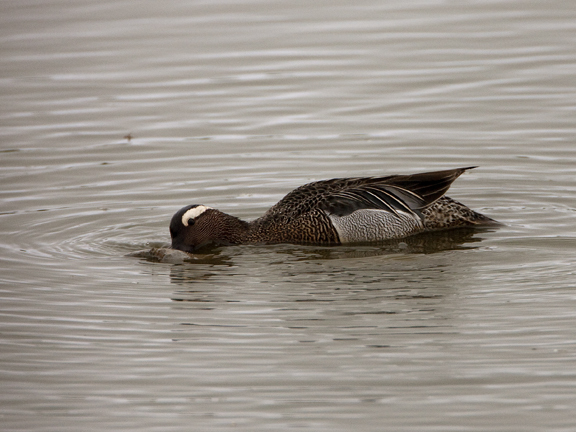 The Garganey are dabbling their way around the far side of the pool. I've not seen a Garganey for a couple of years so its good to catch up with this pair. Later on when the dust has settled on the day I am reading up on the species and the book says "spends most of thier time feeding with heads underwater, rarely upends". Yes, that was spot on! For most of my time at Gilroy they swin lazily about with heads submerged. More birders arrive, tick, leave. The Garganey continue to feed. 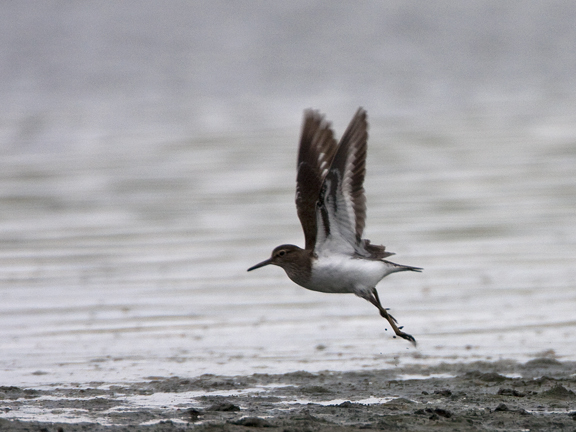 Common Sand has de-camped to the far side, it seems too busy on the footpath for it. 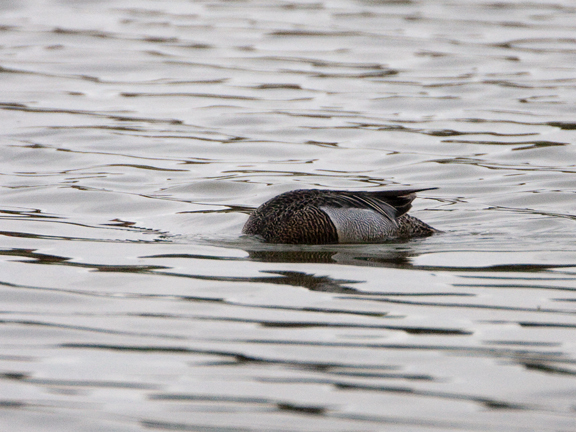 Something spooks a lot of the birds, can't see what it is but it pushes the Garganey closer. They are still nervous, although clearly still peckish too. An eye is kept out on the sky for threats, but bill is kept in the water filtering away. The male is also making a brilliant hoarse croaky sort of call as he glides alongside his partner, it sounds more amphibian that avian. A text alert signals full time on the days action, tea is on the table. Time for one last portrait before zooming home.